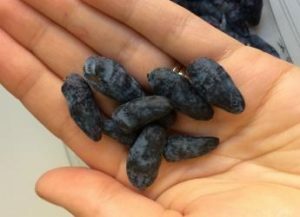 A research collaboration between REMIN, the James Hutton Institute, James Hutton Limited and a group of Tayside soft fruit growers led by Arbuckle’s of Invergowrie has been awarded funding to investigate the economic potential of honeyberries grown using volcanic rock dust fertiliser. Due to its agronomic qualities such as winter hardiness, frost, and pest and disease resistance, honeyberry (Lonicera caerulea) has the potential to become the ‘fifth’ berry amongst the commercially grown fruits in Scotland after strawberry, raspberry, blueberry and blackberry, showing potential for diversification at low inputs infrastructure. Dr Dorota Jarret, fruit breeder at James Hutton Limited and lead academic contact for the project, said: “Our aim is to develop a system for improving plant establishment, health and soil performance in honeyberries, using natural and local resources such as volcanic rock dust. It is envisioned that this collaboration will bring multi-lateral industry experience and with substantial added benefit of being able to tackle the challenge of sustainable intensification. REMIN is an innovative Scottish company supplying organically-approved, award-winning soil and compost improver as local, freshly crushed volcanic rock dust. Operating out of Banchory, Aberdeenshire, its products provide minerals and trace elements that are increasingly hard to come by and often referred to as the foundation of plant health. The project is one of four sharing £25,000 awarded to winners of Interface‘s Multiparty Competition. Interface is an unique service connecting businesses from all sectors to Scotland’s universities, colleges and research institutes, designed to address the growing demand from organisations and businesses which want to engage with academia. Suzanne Dawson, Head of Sector Engagement at Interface, said: “These projects have the potential to not only benefit the groups of businesses and the academic institutes directly involved but also the wider food & drink and tourism sectors. “Encouraging new products, services and processes is at the heart of what we do and can lead to positive impacts on Scotland’s economy, both in cities and rural areas.